This is In Real Terms, a column analyzing the week in economic news. Comments? Criticisms? Ideas for future columns? Email me, or drop a note in the comments. It’s July, which means that across the country teenagers are flipping burgers, scooping ice cream and mowing lawns to save up money for school clothes, movie tickets and — oh, right — college tuition. 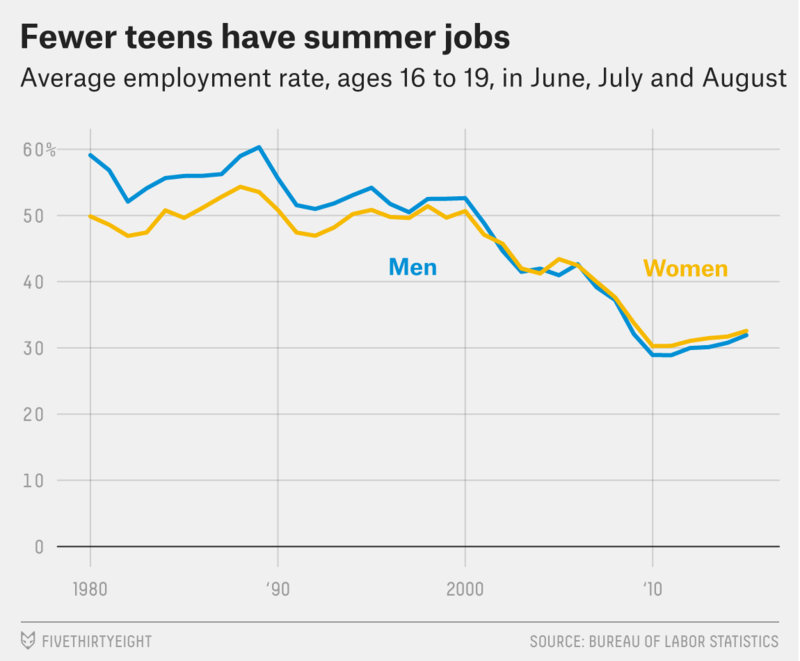 But fewer young Americans are working summer jobs than in decades past, and fewer of those jobs are going to the teens who need them most. The improving job market is gradually beginning to benefit teens, who are often among the first to lose jobs during a recession and the last to find them in a recovery. During the 2008-2009 recession, the share of Americans ages 16 to 19 working during the summer plummeted from 40 percent to less than 30 percent, a steeper drop than for the population at large. But last year, the teen employment rate rose to 32 percent, and with the unemployment rate now below 5 percent, most experts expect even more teens to find jobs this year. Teens from less privileged backgrounds face numerous barriers to finding jobs. They are less likely to own a car (or have access to one), and often live in areas where jobs are scarce. Their parents are less likely to be able to help them get a foot in the door at a local business. They may attend schools that are, or are perceived as, inferior, making them less attractive to prospective employers. And they may face discrimination based on race, class or other factors. None of those barriers is new, of course, but they may have grown higher as the U.S. has become more unequal and more segregated by class. 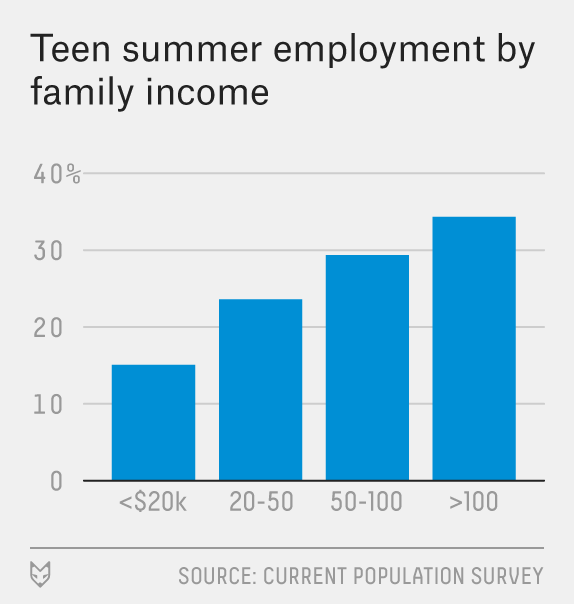 Unfortunately, low-income teens are also the ones who most need summer jobs. They need the money, of course — a job that might provide pocket-money to a middle-class teen could be a key source of income for someone from a poorer family. But they also need the experience. Young people from low-income backgrounds can’t count on family connections, expensive extracurricular activities or, in most cases, degrees from private colleges to help them land jobs as adults. So they are particularly dependent on work experience to get ahead. Past research has found that at-risk teens who work perform better academically, are less likely to get into trouble with the law and earn more as adults than those who don’t. Earlier this year, President Obama unveiled a new effort to boost summer employment among teens, especially those from low-income families. Many cities also have their own programs. But the surest way to ensure that teens can find jobs is to improve the overall economy: Because teens are often unattractive to employers (who see them, correctly or otherwise, as inexperienced, unskilled and unreliable) they can have a hard time finding jobs until the unemployment rate gets low enough that companies have no other options. That’s what happened in the late 1990s, when the unemployment rate dropped to 4 percent and teen employment rose as companies scrambled to find enough workers. The economy has shown significant improvement in recent years, but those gains haven’t yet trickled down to some of the hardest-to-reach corners of the job market. One way to gauge what investors are thinking is to watch the London stock index known as the FTSE. Or really, two indexes: the FTSE 100 (essentially the 100 biggest publicly traded companies on the London Stock Exchange), and the FTSE 250 (the next-largest 250 companies). The FTSE 100 is dominated by huge multinational corporations such as the drug giants AstraZeneca and GlaxoSmithKline, big banks such as Barclays and HSBC and mining companies like Glencore and Rio Tinto, as well as consumer brands such as Burberry and Unilever. Those companies have customers around the world, insulating them somewhat from the turmoil in Britain; some might even benefit from the sharp drop in the value of the pound, which makes their products look cheaper overseas. The smaller companies in the FTSE 250, by contrast, are mostly domestically focused and are therefore much more vulnerable to a downturn in the British economy. Both indexes cratered when the results of the Brexit vote became clear last Friday. Since its initial drop, however, the FTSE 100 has rebounded and is back to where it was before the vote; the index is up slightly for the year so far. The FTSE 250, however, kept falling after the vote, and although it has rebounded somewhat in the past two days, it remains far below its pre-Brexit level. Taken together, the behavior of the two indexes suggest that investors see the global economy coming through the Brexit drama relatively unscathed, barring further unexpected developments. But they expect Britain to face a long, difficult road ahead. A survey of influential economists this week found that a strong majority, 58 percent, oppose the idea of a “universal basic income.” That prompted lots of chatter on Twitter (well, at least on the corners of Twitter frequented by econ nerds like me), where the idea of a basic income has drawn a vocal following in recent years. But the survey was too narrow to provide much insight into how economists view the basic income concept more generally. The respondents opposed a very particular version of the proposal. And as Jim Pethokoukis wrote Wednesday, with universal basic income, the details matter. The idea behind a universal basic income is simple: Instead of the current patchwork of safety-net programs — food stamps, housing assistance, retirement benefits — just give everyone cash. (My colleague Andrew Flowers delved into the topic in much more depth in a great story this spring.) One thing that makes the concept intriguing is that it seems to have support from across the ideological spectrum; liberals like the idea of bolstering the safety net, while conservatives like that a UBI would replace inefficient government programs. But while the left and right might both like a UBI in theory, it’s always been doubtful that the two sides could agree once they have to start making decisions on how much money to give people and how to pay for it. A well-framed survey of economists might have given some sense of how far apart different groups are. On Friday, I tried to make sense of the Brexit mess, while University of Chicago economist Anil Kashyap said the vote might be just the beginning. On Tuesday, Farai Chideya weighed in with a look at what Britain’s decision might reveal about the U.S. election. On Thursday, Farai and I talked to Grace Powers of the National Able Network in the latest installment of our Kitchen Table Politics podcast series. This week’s topic: good jobs, and how to help more Americans get them. On Wednesday, a coalition of local and national media organizations launched a coordinated barrage of stories on homelessness in San Francisco and what can be done about it. The San Francisco Chronicle has collected most of the stories on its website. Emily Badger and Darla Cameron document the rising price of homes in inner cities — the very places middle-class Americans once abandoned. Laura Kusisto says that because of rent increases that are far outstripping wage growth, renters today really do have it harder than their parents did. Justin Wolfers looks at the spike in uncertainty that followed the Brexit decision. We often hear about the median pay in a given field, but medians only tell us so much. In a cool interactive graphic, Nathan Yau shows the distribution of earnings for various occupations. CORRECTION (July 1, 9:41 a.m.): An earlier version of a chart in this article erroneously included employment data from May through August, rather than June through August.